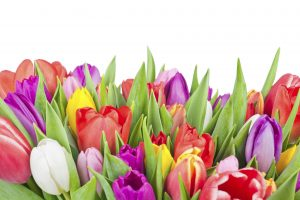 Tulips are available in a rainbow of colors. They can grow up to 2 feet tall! We have survived the winter season. As the weather begins to warm up, homeowners can start turning their attention to their gardens. A beautifully landscaped garden can be a focal point for any yard. With many species of flowers available in the spring, it can be overwhelming to choose the right flowers to plant this season. Not only do you have to consider color combinations, but you also must account for the climate, the soil, and how much water you need. To make it a little easier for you, we have put together a list of the most popular flowers you can plant in your garden this spring! A dramatic name for such a beautiful flower. They get their name because their flower buds look like small hearts, which dangle off each branch. It is important to realize that bleeding hearts only make a brief appearance every year. When the weather heats up, their beautiful pinkish color fades, and they will take on a yellowish color. A bleeding heart thrives when it is planted in moist soil. However, the soil needs to have good draining capabilities. The roots of a bleeding heart can rot if they are left in wet soil for extended periods of time. Ideally, bleeding hearts should be planted in partial shade locations. Are you looking for an easy flower to grow this spring season? Daffodils are not only easy to plant and maintain, but they are also dependable. They will spread throughout your garden and leave you with a lot of beautiful coverage. Daffodils are shaped like tiny trumpets that are usually white and yellow. Daffodils require full sun. You should not consider them a viable option if your garden is in a shady spot. You also need to provide them with soil that can drain moisture well. Tulips are charming flowers that will brighten up any property. They are available in a rainbow of colors. They can grow up to 2 feet tall! Along with daffodils, tulips also need full sun and well-drained soil to thrive in your garden. This entry was posted on Sunday, April 1st, 2018 at 8:39 am. Both comments and pings are currently closed.